We have thousands of properties for sale all over France. But we've no property for sale in Chartres at the moment. And that's something we want to change. If you have a property to sell in Chartres (or nearby) then act now to get a 50% discount. Just place your advert in the normal way (Click here to place your advert). Then send us an email quoting "Chartres" and telling us that you you saw this offer. The city of Chartres is dominated by its stunning 13th-century cathedral which is seen as one of the greatest achievements of Western civilisation. The cathedral is peaked by two, very different spires, one Gothic and one Romanesque. Home to many treasures including the 'Holy Veil', which is said to have been worn by the Virgin Mary during the birth of Christ, the cathedral is not just a present day attraction. Through the ages, pilgrims from all over the world have journeyed to Chartres to either help with the construction of the cathedral or to just admire. To the east of the cathedral, you can expect to find Chartres' superbly preserved old city. This borders the River Eure which makes for relaxing views. When travelling through the old city, one can expect to observe handfuls of historical sites of interest such as the 12th and 13th-century 'Eglise Saint Pierre'. Having once been part of a Benedictine monastery, founded in the 7th century, the church was originally outside of the city walls, making it open to attack. Monks found refuge in the ancient bell tower which dates back to 1000. Chartres is well stocked for restaurants. Menus are very varied whilst remaining at a reasonable price (usually between 9-13 Euros for a main course). Sampling some of the world's best wines under the shadow of the most beautiful cathedral in the Europe is not something you should miss. Although the city is dominated by its cathedral and historical past, the general atmosphere is lively and easy going with many activities occurring throughout the year. The theatre in Chartres is very popular amongst both visitors and locals. It brings you some of the great French plays and offers a relaxing break from the grilling daytime program you may have introduced. Large numbers of trains leave and enter Chartres from Paris' Gare Montparnasse. The journey takes around 60 minutes. You are unlikely to find many bargains in this part of France as most were found and bought many years ago, however, occasionally, amazing offers are exposed so keep an eye out. Prices in the area tend to be above the national average across other regions. Do you know Chartres better than we do? Do you have photos of Chartres? Chartres is the capital of the Eure-Et-Loir department of the Centre-Val-De-Loire region in central France. 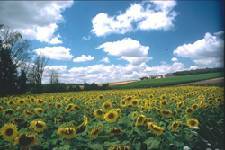 It is situated to the north west of Orleans and lies 88km south west of Paris. Access: In order to get to Chartres, one can take the Channel Tunnel through to Paris and then either local train or TGV to the city. It could be wise to hire a car in Paris due to availability. Economy: Chartres has a thriving tourism industry through the worldwide interest in the cathedral. Interesting fact: At the time of antireligious fervour in 1791, revolutionaries decided that the cathedral should not just be burnt and desecrated. They brewed over the possibilities. This brewing continued for five years until the revolution ended and the cathedral saved.